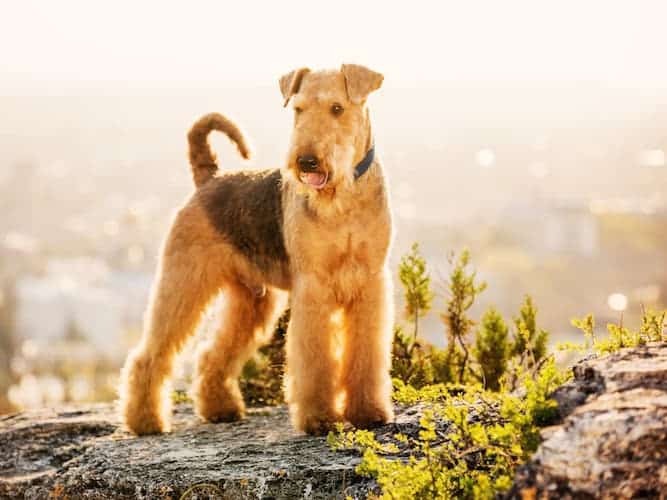 If you plan to own an Airedale Terrier, this article will reveal the good and bad about the Airedale Terrier temperament. As you know a dog's temperament drives many of his natural behaviors. Learning these temperament traits now gives you the power to decide if adopting or buying an Airedale Terrier puppy would be a good decision for you. This dog breed, the largest of the British terriers weighs in at around 44-66 lbs (20-30 kgs) and originated in Yorkshire, England. He is a handsome dog standing approximately 2 feet tall. We all have good or bad qualities and the Airedale Terrier is no exception. 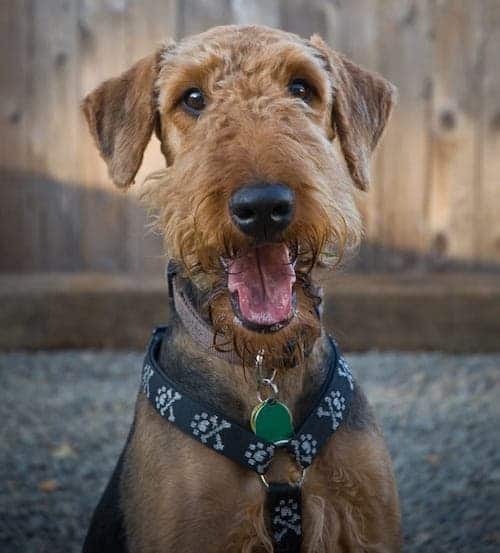 Airedale lovers will tell you that he is alert, confident, courageous, friendly, intelligent and outgoing. But Airedale critics point out that they can also be aggressive, destructive, rowdy, strong-willed and stubborn. The Airedale was bred to be an independent hunter (of otters, originally) and it still does well as a working dog. 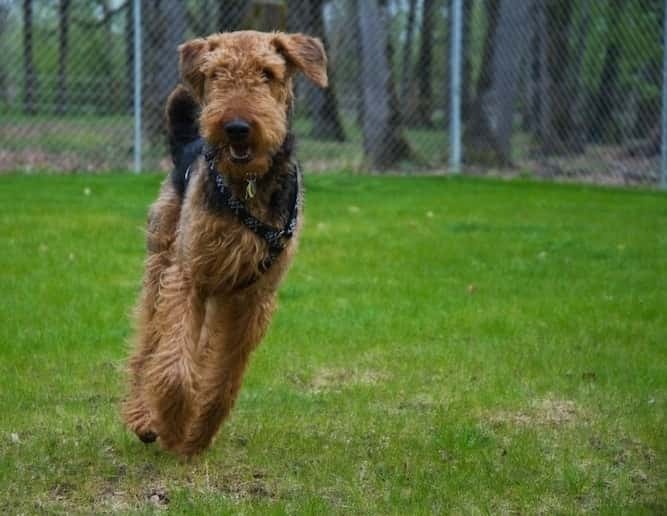 Like other dogs that are bred to be hunters — the Dachshund, for example — owners should not be surprised that Airedales have an independent, stubborn streak in them. That said, Airedales are extremely smart and they have been known to do well in obedience and agility events. Like other intelligent dogs, Airedales need to be engaged through regular mental and physical stimulation. If his life is that of a working dog, he will be a happy camper. If not, you must make time for him on a regular basis. This is not an apartment dog that will be content to be left on his own. If he is bored, he can be extremely destructive and since he is big, he is quite capable of turning one’s apartment upside down. The outgoing Airedale Terrier temperament makes him a confident dog. However, an Airedale can, on occasion, become aggressive so it is important through his regimen of training that you clearly and very early on show him who's the boss. Additionally, as a puppy, he must be adequately socialized so that he is not only obedient but also a good fit within your family, including with your other pets. However, it is not a good idea, no matter how “sweet” your Airedale’s temperament is, to have pets that he would naturally consider prey, like rabbits, hamsters or rats. Your Airedale can be very vigilant. This can be good or bad, depending on the circumstances. On a farm, for instance, it can be a good thing; in town, however, this could quickly become a problem. This is especially true in how protective he can be, even possibly becoming aggressive with strangers. I must reiterate here the need for early socialization, as well as the need for you to establish his position in the family hierarchy. Don’t let him do it, or he’ll walk on you forever. Doing this will also help his behavior in the presence of younger children. 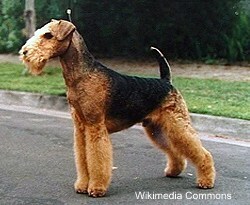 The Airedale is an athletic breed, a hunter. He needs his physical exercise. Without it, he will have a ton of nervous energy in surplus, and he will search for an outlet. If, as is possible in such a situation, he is also not getting enough attention and mental stimulation, he is going to become a handful, barking at the slightest provocation and chasing anything that moves. Individuals vary, and their requirements change over time. As a puppy, you will have to keep him occupied on a regular basis; as he matures, his needs will reduce. You will have to tweak his regimen as his personality matures. Somewhat surprising for an “independent hunter”, the Airedale loves a lot of attention. The more time you can spend with him, the happier and more stable he will be. Hand in hand with his love of attention, he enjoys being trained. Like all other dogs — a fact increasingly recognized by animal behaviorists — he will respond better when given plenty of positive reinforcement. Did you know that, for some skills, humans take ten thousand repetitions to properly learn an action? Your Airedale is perfectly fine with repetitions; with luck, though, the skills you are aiming for will not need ten thousand repeats! At the very least, you should train your Airedale the most basic of commands, like come, stay, and sit. Because he’s so smart, and because he loves spending time with his family, training him should not be too much of a chore. However, the smarter the dog, the more bored he can become. For this reason, make sure you keep training sessions short and incorporate plenty of challenging toys to hold his interest. What follows are some brief facts about the Airedale Terrier and how he came to be. In the mid-19th century, working people in Yorkshire, England created the Airedale Terrier dog breed. The origin of the Airedale’s name comes from the River Aile, which runs through the West Riding of Yorkshire area. Hunters used Airedales for hunting animals in the water and also for hunting rats. Airedales also worked during World War II as mail and message deliverers, sometimes delivering messages with fatal injuries. It was more important they accomplished their goal first –dying could come later. 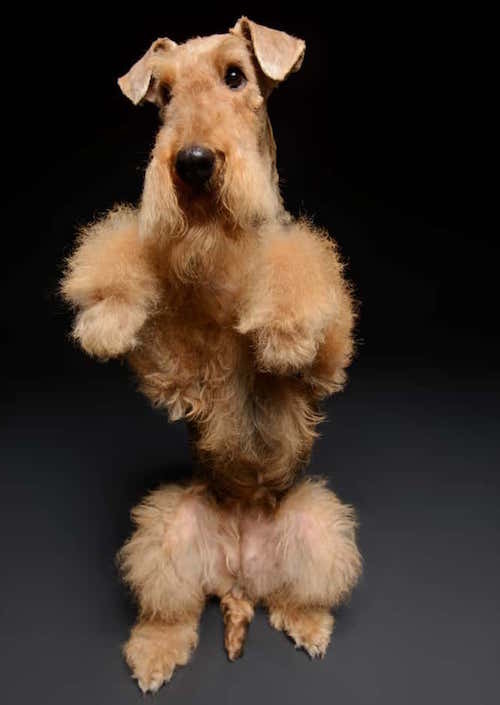 If anything, this certainly speaks to the courageous part of the Airedale Terrier temperament. The Red Cross also used Airedales to locate wounded soldiers on the battlefield. You don’t need to do much to take care of the Airedale’s coat, as he doesn’t shed much. Brush him once a week to keep him looking clean, and remove mats by separating them with your fingers, then teasing them out with a comb. While no dogs are truly hypoallergenic, some Airedale owners say they suffer less allergies around an Airedale, so long as they regularly brush their dogs. You should take your dog for a “full grooming” quarterly. A “full grooming” consists of bathing and brushing, followed by a stripping or clipping (haircut) of the dog’s coat. As mentioned earlier, Terriers have a high energy level. With an Airedale, you must especially engage him in regular exercise. Doing this will keep him healthy and help him maintain a great mood which deters him resorting to destructive behaviors. Click here to find out how exercise helps dogs with bad behavior. He loves to play with his family members, and he enjoys either playing around in the yard or going for a moderate walk several times a day. Airedales can play well with children, but you must still supervise them due to their strength. They may accidentally injure a child, especially while bouncing around all over the place. He can adapt well to apartment living, so long as you exercise him as he requires. Any dog can be destructive when he has extra energy to spend, and this is a problem that is only made worse sometimes by smaller living space. The average healthy weight for an Airedale Terrier is between 40 and 44 lbs. for a female, and between 51 and 64 lbs. for a male. As far as their height is concerned, the average Airedale Terrier is between 22 and 24 inches high. The Airedale Terrier’s lifespan is between 10 and 13 years. So, you've decided that you'd like to add an Airedale Terrier to your home. That’s great! You can find an Airedale Terrier for sale either from a breeder or through your local animal shelter. The cost of an Airedale Terrier varies, based on where you get him from. The average Airedale Terrier price is around $1,400. However, if you go for a higher pedigree of dog, or one with a lineage involving show dogs, you can easily spend up to or over $5,000. If you want to adopt an Airedale Terrier puppy, you may be able to find one at your local rescue center. You may want to go the adoption route if you want to skip the puppy stage entirely and opt for an older dog. Of course, you can always adopt a puppy if one is available but shelters typically have more older dogs than younger ones. And if the older ones do not appear to have training when they come in, the shelter workers do their best to make them more adoptable by training them themselves. If you’re interested in finding a good Airedale Terrier breeder, you may want to try the Airedale Terrier Club of America. Official websites are less likely to promote breeders who aren’t above board, as this puts their own reputation on the line. Never buy a puppy from a puppy mill or store. These dogs are only bred for profit, not for quality, and you may end up paying top dollar for a dog with a host of health problems. Keep in mind that there is marked variation in owners that share a common breed. 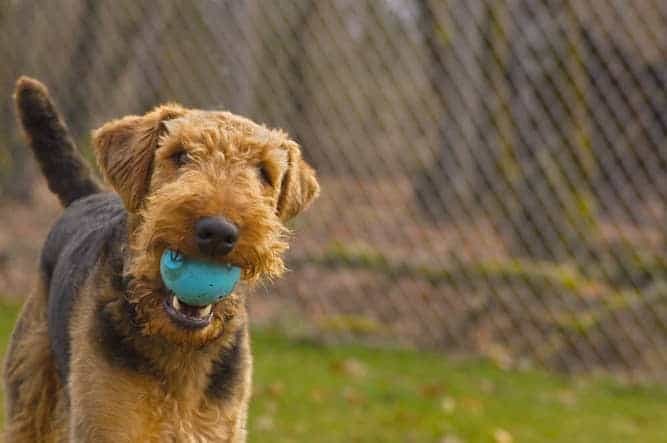 There are animal professionals who assert that the variation within a breed (Airedales, for example) can exceed the variation across breeds (like Airedales vs. Cairns). So, while we have given you some clues as to what to expect from your Airedale, remember that your Airedale Terrier’s temperament is unique. You will need to remember this when determining how to treat him.